Andrew and Anthony are getting married – and everyone wants to "help"! My Big Gay Italian Wedding spins into a hysterical fiasco as everyone tries to have their way. From a saboteur ex-boyfriend to a loud, opinionated, outspoken Italian mother, personalities and culture collide in a music and dance-filled extravaganza. ANGELA PINNUNZIATO ‐ late 40s female. A lovingly over‐bearing, over‐powering Italian mother hen. Rules the roost with an irori fist and a wooden spatula. Anthony’s mother. LEAD. GREGORIO ‐ 20s ‐30s male. Smoking hot and extremely narcissistic. Does not take rejection well. Always has something up his sleeve. LEAD. MARIO ‐ 20s‐30s male. Uptight fashionista, Anthony’s best friend and protector. The most fabulous dancer in Brooklyn. Anthony’s Best Man. SUPPORTING. LUCIA ‐ 20s ‐ 30s female. Brassy, trendy Italian woman. Anthony’s dependable, reliable best friend. A feminine, pretty lipstick lesbian, classy and sophisticated until challenged. Maid of Honor. SUPPORTING. CONNIE ‐ 20s ‐ 30s female. Lucia’s nemesis. Just as pretty, but much tougher. The gum chewing mouth of a truck driver who doesn’t take crap from anyone. Bridesmaid. SUPPORTING. RODNEY ‐ 30s male. Sassy and spirited. Always up for an adventure. In love with Frankie. Reveals himself in drag in Act Two. All ethnicities can work in this role. 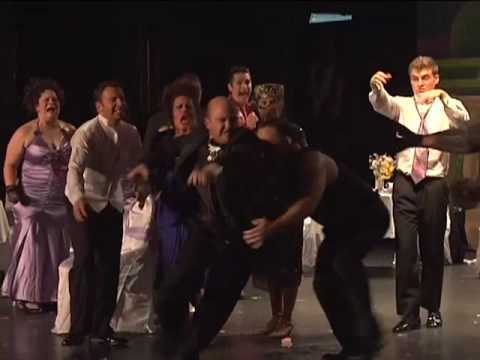 My Big Gay Italian Wedding premiered at the Actors Playhouse in New York City in November 2003 under the direction of Peter Rapanaro.